BiblicalEthic.org - Hobson's Biblical Choice Blog - Adam-ondi-Ahman: Adam in Missouri? Because I have had a heart for the Mormon people for over 40 years, I just had to visit Adam-ondi-Ahman on our recent family trip westward. Adam-ondi-Ahman is the place in northwestern Missouri where we are told that Adam and his descendants gathered for a final blessing before Adam’s death (Doctrine and Covenants 107:53). It is also the place where Adam will return to visit his people in a global event at some unspecified time in our future (Doctrine and Covenants 116). 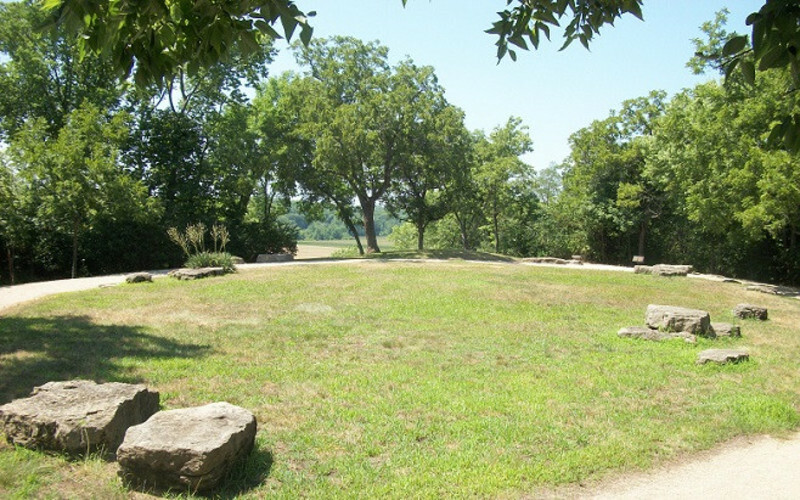 According to later Mormon sources, Joseph Smith taught that the Garden of Eden was in Independence, MO, and that when Adam was driven out of the Garden, he built an altar at Adam-ondi-Ahman. The modern site is a beautiful section of woodland and fields near Jameson that overlooks the Grand River. It was originally called Spring Hill. The land is now owned by the LDS Church. There is no visitor center or any tourist fanfare; perhaps the lack of publicity is good for a site considered to be sacred. Also included in the site is Tower Hill, where Joseph Smith states that he discovered stones from an old Nephite altar (see his History of the Church 3:35 – the Nephites are a Book of Mormon people). The stones in the above picture are not claimed to be the ones Joseph saw, but they come from the right area, so who knows? Joseph Smith began to build a town here in 1838, and planned to build a temple. However, as the town grew to over 1000, a local militia/mob drove them to evacuate both Adam-ondi-Ahman and Far West, a larger Mormon settlement 35 miles to the south, where four foundation stones were laid for the proposed temple. Violence against Joseph’s followers culminated in the hideous Haun’s Mill massacre, which shocked the rest of Missouri, after which the Mormons made their move to Nauvoo, IL. Today, despite the thousands who once gathered in these two places, virtually no signs of settlement remain at either site, other than the temple foundation stones at Far West. It is easy to understand why today’s Latter-Day Saints often interpret any attempts to oppose or convert them as being more of what they endured in Missouri. Whatever motives may have been involved, what was done to Joseph’s followers in Missouri did not advance the cause of truth. To believe that Adam came to Missouri is a leap of faith. But it is just as much a leap of faith to believe that he lived in Mesopotamia, let alone to believe in the existence of an historical Adam of any kind. Genesis does not specify where the land of Nod (“Wandering”) was to which Adam and Eve went when exiled from the Garden of Eden, but Genesis does specify that the Garden itself stood at the junction of the Tigris, Euphrates, and two other ancient rivers. One must choose between the Bible’s location for Adam, and the claims of Joseph Smith, which drives home the question of whom we regard as our ultimate authority, in the absence of further evidence. One must also be sure that the reports on what those sources say are reliable. How do we know what Joseph Smith really taught about Adam in Missouri? The most reliable reports are those that come from Joseph’s own pen: reports from the Doctrine and Covenants, and from his History of the Church (based on his own diary). Less reliable are reports from his apostle Heber Kimball, from the fourth LDS prophet Wilford Woodruff, and from Joseph Fielding Smith, the sixth LDS prophet, who was a nephew of Smith himself and who was born at Far West, MO (!). If one subtracts the secondary reports, we have no Garden of Eden in Missouri, only an alternative site for the Land of Nod to which Adam and Eve were driven, a teaching that does not contradict the teaching of Genesis. We in Nicene Christianity have a parallel predicament. How do we know what Jesus really taught? We are relying on the testimony of Matthew, Mark, Luke, and John, not on the word of what we find to be spurious books. We are thankful that those who lived near the end of the first century AD, who still remembered what Jesus really said, identified for us which books we could rely on for the truth about Jesus. Whomever you trust, make sure you know the truth about the one on whose words you are betting your soul. I find the Bible to stand head and shoulders above any other voice that claims to speak for God. There is so much hard evidence to back up what the Bible says, that even in places where evidence is lacking, I am compelled to give the Bible’s word the benefit of the doubt. Adam in Missouri? The Missouri state motto is: “Show Me.” Let evidence and reliable testimony lead us to the source of truth on which we can build our lives.